We are a family wedding catering company based in Stockbridge, Hampshire. We have been established since 2005 and our menu's are very much tailored to your budget and requirements. We offer a very friendly personalised service and our wedding planning service is an integral part of our wedding package. Typically our inclusive wedding packages for your big day start from just £25 per head. We offer a child discount for ages 4-11 years inclusive. We are not licensed and very much like our clients to purchase their own drinks which we will serve. No corkage is payable, but we simply charge for our glass hire service. Our unique service is our "Clean and Clear Away Service" at the end of the function, which can include removing and returning items used to decorate your wedding venue. 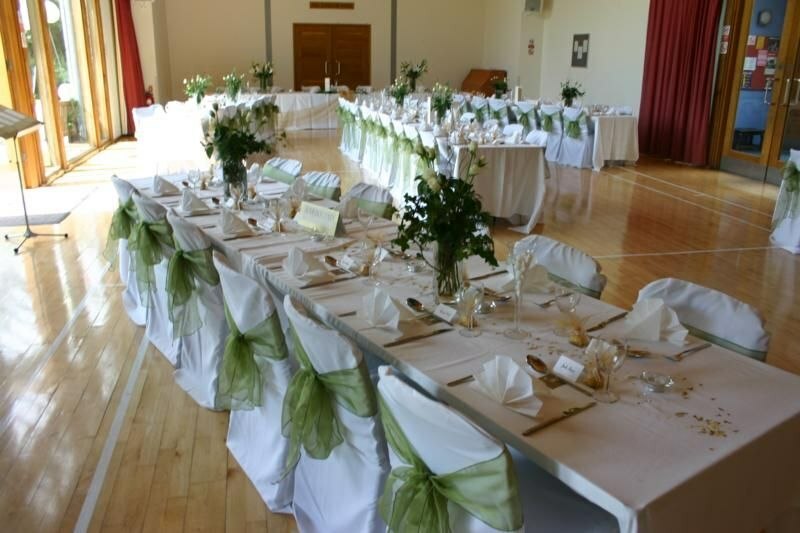 We have a wealth of experience of planning and organising wedding receptions to the finest detail. Charles and his team catered for my 40th birthday party. Food was amazing - hog roast with all the trimings. Great value and they were really helpul and friendly throughout! Would recommend. Many thanks for your review Lauren. It was a pleasure to work for you. Charles helped us out at the last minute, which was very much needed and appreciated. He communicated regularly in the short lead up to the event, and was consistently friendly and professional. The cake was particularly popular at our event, and I know, given the damp weather, that visitors were also grateful for the hot food and drinks on offer. Thank you Charles and team. Many thanks for your review Caroline. Charles was brilliant from start to finish. He took our booking last minute, visited the site and provided exactly what we needed. The freshly baked scones for the cream teas were fabulous and the burgers were a big hit. I would highly recommend Charles for any outdoor event and I shall be using him again. Many thanks Sarah, it was a pleasure to work for you. I Would highly recommend, All food freshly cooked and prepared at our home. We had the pork, potato salad, fresh salads and coleslaw, a vegetarian/vegan chilli was also served for a few members. The food was plentiful and delicious, the pork crackling was the best. We later had freshly baked scones with homemade jams and clotted cream, these were also baked at our house and served fresh. The coffee machine was an added bonus serving cappuccino, Latte etc. They started at 8.30am and finished when they had cleaned and packed away all their equipment. Cutlery and crockery (not paper/plastic) were supplied by them and food was served. A lovely family who worked hard to make us have a fabulous day. Many thanks Loretta, it was a pleasure to cater for Alan's 80th Birthday. The food was excellent and we even had the left over hog roast for a great meal the next day! The staff were all extremely helpful and gave he perfect balance between being attentive and making sure everyone had everything they needed whilst also blending in and making sure everything ran without a hitch. Everyone commented on how good the food was and the service. They were also so helpful in the clean up meaning we had the minimal amount to do at the end of the night and the next day. Really helped add to our perfect wedding day and wouldn’t hesitate to recommend them to anyone else. Many thanks for your excellent review which is much appreciated. The caterers worked hard on a long hot day for which we were very grateful. Whilst we had thought communications had been good, we were shocked to discover on the day of the wedding that two pork joints were to be served rather than the anticipated spectacle of a hogroast - we would definitely not have used this caterer had we known this. There was insufficient crackling for everyone, no stuffing at all despite being assured this would be supplied. Gluten free options were poor and unimaginative, chicken for Muslim guests (advance warning was given) was served from the same platter as the pork, vegetarian option and salads were 'ordinary'. Unexpectedly disappointing food, but thankfully this did not spoil our wonderful day. Hello Lesley I was extremely disappointed to receive your feedback which was done in a way to cause maximum damage to my business. We had no issues whatsoever on the day, only thanks from you, Martin & many of your guests. The following day when we returned to collect our marquees, again there was no negative comments whatsoever. We were asked by several guests for our business cards & Martin thanked us profusely in his wedding speech. Several guests, including the Bride & Groom, separately thanked us for the quality of our food & service. A Wedding Reception for 75 guests, including the hire of 5 marquees for 4 days & a Real Italian Coffee Machine hire inc Barista for sub £1,000 represents incredible value. Charles from Catering4Occasions was very helpful. Good communication and the event went very well. Set up was speedy and efficient and the delicious food was served quickly and without fuss. I will use Catering4Occasions again. Being running event organisers, we have used many different caterers for our events in the past but I can safely say Charles and family have been absolutely fantastic throughout. The best communication ever and I am absolutely thrilled that they charged our runners sensible and not the usual extortionate prices we have seen in the past. Everything on offer was good value for money and the food and drinks we all had was of a very high standard... The cheese burgers were devine! We cannot thank Catering 4 Occasions enough and we will be offering them all our event catering (where allowed) to them in the future. Many thanks for your review. We look forward to working again for you & your team on the 28th October 2107. Great service beyond expectations. Years of experience mean that Charles is prepared for any last minute challenge. Not even a broken electricity socket stopped the party. He had a replacement one to fit! Many thanks for your review. It was a pleasure to work for you both. Many thanks for your review Rachel. Get quotes from Catering 4 Occasions and others within hours.